Free performances and workshops, with: Thunderdrummers Cumbria, Hanabi Daiko, Bidwell Brook Special School, Oku Nojo Daiko, Gyoko Taiko, Ikazuchi Taiko (Falmouth), Sun Lotus Taiko, Taiko Mynydd Du. Workshops, with: Mark Alcock; Oliver Kirby; Hannah-Jasmine Brunskill; University of Exeter Japanese Society; James Barrow; Mark Alcock; Pete Goodman; Tano Taiko. Workshops with: Kaminari Taiko;Oliver Kirby & Guy Shread; Alice Kemp-Welch; James Barrow; Hibiki Ichikawa; Tano Taiko; Adrian Freedman; Amanojaku; John Bolwell. 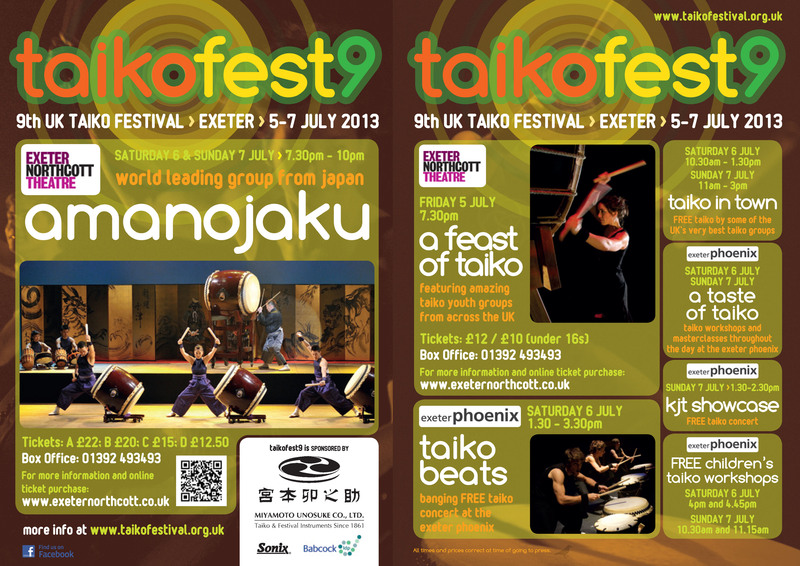 – Free performances and workshops with Hanabi Daiko, Taiko Evolution, Sakai Taiko, Kayobi Taiko, Tanoshii Taiko, Tano Taiko, Taiko Mynydd Du, Kaminari Taiko. This video is courtesy of Dave Rodwell. It features short extracts from performances by all the groups who performed in Taiko Beats – the Saturday lunchtime concert given by adult community groups from the UK and, in this case, also from Germany. See also: 1st UKTF; 2nd UKTF; 3rd UKTF; 4th UKTF; 5th UKTF; 6th UKTF; 7th UKTF; 8th UKTF; 10th UKTF; 11th UKTF; 12th UKTF.